Standard precautions refer to safeguards taken that help to keep employees and consumers protected and healthy when there may be the potential to come into contact with blood or other body fluids. Health care workers (doctors, nurses, and laboratory technicians) are especially at risk of exposure to this type of hazard. Emergency personnel (firefighters, police officers, and paramedics) are also in a high-risk group. Typical standard precautions will vary, depending on the work environment. Nurses and laboratory technicians have different safety standards than office workers. Everyone should observe some basic safety precautions on the job to keep themselves and their coworkers safe. If soap and water is not available, an alcohol-based hand sanitizer may be used to clean the hands. Recommended hand sanitizers should contain at least 60 percent alcohol to be effective. Under OSHA Regulation on Occupational Exposure to Bloodborne Pathogens, 29 CFR 1910.1030, (d)(2)(iii) and (v), employers are required to provide hand washing facilities to their employees. They also must ensure that employees wash their hands immediately "or as soon as feasible after removal of gloves or other personal protective equipment." Employees must wear protective gloves if their hands may potentially be in contact with blood or other bodily fluids. Employers are required to provide hypoallergenic gloves at no cost to the employee. Employers also pay for the cost of replacing these items, unless the employee has lost or intentionally damaged them. While there are no specific guidelines stating that gloves must be changed in between patients if they have not been contaminated and if the barrier has not been compromised, this is not the recommended level of care to prevent transmission of disease. OSHA regulations regarding use of disposable gloves vary from state to state. For more detailed information, contact your state's Department of Labor. 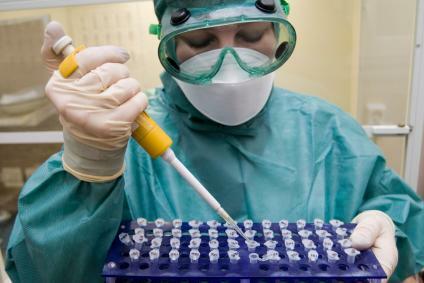 Depending on the workplace, some forms of PPE may be disposable, such as single use gloves used by laboratory technicians when drawing blood samples from patients. Medical protective clothing, including gowns, utility gloves and face shields may be decontaminated, and reused. These types of items will need to be inspected regularly for signs of wear. If they have been punctured or show signs of peeling, they will need to be taken off the floor and replaced immediately. Employers are required to conduct a workplace hazard assessment to determine whether hazards are present or are likely to be present. Once hazards or potential hazards have been identified, the employer selects the appropriate PPE to be used. The employer is responsible for providing training to each employee who will be required to wear the equipment on "how to properly don, doff, adjust, and wear" it. Dispose of needles and any other fluid-touched items in the proper containers. For instance, needles always go in a designated sharps container and other items such as blood-stained clothing should go in separate bins as well. If a needle or another breakable item (such as a drinking glass) that's contaminated falls to the floor and breaks, use a broom and dustpan to pick it. Do not use your hands, even if you are wearing gloves. Always report any fluid contact to a supervisor. Obtain follow-up health care if necessary. Injuries and illnesses involving sharp objects and needle sticks that have been contaminated by someone else's blood or another potentially infectious material must be recorded. Employers must record them on the OSHA 300 log as an injury. For privacy reasons, the employee's name is not included on the official record. All workers who may be exposed to biohazards have the right to be safe on the job. Implementing universal precautions is a legal requirement to reduce the risk of workplace injuries. Lowering the risk of injury is a shared responsibility between workers, supervisors and employers alike.